The first film of my double feature was one that I listed in my “Top 10 Most Anticipated Films of the Summer Movie Season” section back in June. As someone who has an undergraduate degree in Psychology I find just about any and everything interesting that’s even remotely related to exploring why we as humans act and think in the way that we do. 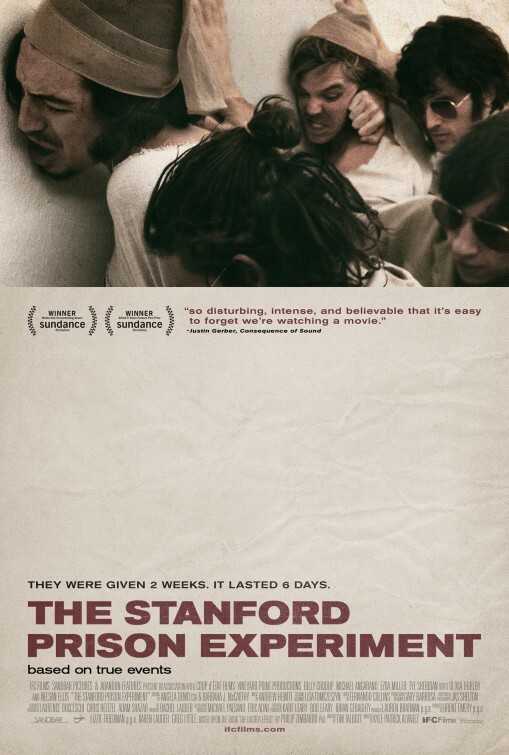 Most everyone I know with even the slightest interest in Psychology knows about the infamous Stanford Prison Experiment that took place in the 1960’s at the ivy league university. An experiment that set out to try to found out whether or not the personality traits between prisoners and guards was the chief cause for the abusive behavior between them. The test itself consisted of one very prominent Stanford University professor, some of his hand chosen colleagues, and a sample group of college students – each interviewed and handpicked prior to the experiment, each of whom were also told very little about the actual experiment itself other than that they would be getting paid $25 a day for their participation in it (not a bad day’s pay for a college student in the 1960’s) and that it would last 2 weeks taking place over summer break. The professor in charge, Philip Zimbardo, and his colleagues then hand-picked 24 students each to split up into 2 groups of 12 – one group which would act as “prison guards” and the other the “prisoners” in the basement of one of the university’s lecture halls that would be made up to resemble a prison. From that point forward for the next 2 weeks they would be put under surveillance and studied by professor Zimbardo and his colleagues 24 hours a day around the clock to study the psychology behind control and the abuses of power. As one unfortunate student (played by “We Need To Talk About Kevin” and “The Perks of Being a Wallflower”‘s Ezra Miller) gives prior to the experiment – “I hope I get chosen to be a prisoner”. When asked why he responds – “because it sounds like they’d have the least amount of work to do”. Boy could he have never been more wrong. This was one of those films, at least in the opinion of this writer, that is catered towards a certain demographic. If you’re the type of person who is into Psychology like myself, and don’t discriminate as to whether it explores either the good or bad in people, well, then this movie should be just about right up your alley. It’s a strong, assured piece of work from its young director, 32-year old Kyle Patrick Alvarez, who tackles one of the more difficult topics with a sense of authenticity that I thought the other 2 films depicting the same experiment – 2001’s “Das Experiment” and especially the forgettable and passable “The Experiment” (2010) failed to do right. Where credit should be given first off should be to the film’s amazing cast. Billy Crudup as Professor Philip Zimbardo winds up being a great casting choice. As does some of the experimentees played by a slew of some of the more notable, young and up-and-coming actors in the business including the aforementioned Ezra Miller (always excellent and a scene stealer here), Tye Sheridan (“The Tree of Life”, “Mud”, “Joe”), and James Frecheville (who I’ve literally been waiting to see reappear since his fantastic work in 2010’s “Animal Kingdom”) as well as several other familiar young actors (I name those 3 specifically because they were the highlights of the film, at least for me). Director Alvarez, this being only the third film into his career, should also be given a fair amount of credit for tackling a rather difficult subject and making it seem real. His posterity and confidence behind the lens shows his mastery and commitment to the material. It’s shot almost clinically and sterile, as any movie about Psychology really should be. Evoking the work of Steven Soderbergh, with his use of oblique camera angles and in terms of its controlled style. The story looks like some kind of docu-drama, which is a true testament to Alvarez as a director and his ability to “reenact” the material with such precision as he does. All of the accolades aside, what I feel almost obligated to point out here is that the film is for “thinkers”, people looking to be challenged other than to be entertaining. The little I share with you about how the experiment winds up turning out (if you don’t have any familiarity with it already) the better. But what I will say is similar to how Craig Zobel’s “Compliance” (2012) depicted humans subordinance to authority figures, well this film explores the same terrain and does so in a way that’s more unflinching and shows it exactly for how it may have really unfolded. It’s a rewarding piece of cinema if you happen to be the right viewer. But for all others it may seem like a bit of an endurance test. Not because it’s slow, but it at times feels exploitative (which I think was/is the point), and to see human beings treating one another so poorly is almost a bit tough to watch. This is a feeling and tone difficult to describe in words, but the last time I felt something close to it was with last year’s “Foxcatcher”. This a great depiction of one of history’s most notorious experiments. But it’s an experience that’s more to be admired and appreciated than it is to be entertained by. Unless you’re some sort of sadomasochist. My second film in my double feature, “Tangerine”, I had been a little bit skeptical of at first, having seen a less than impressive trailer but something that I’ve heard good word-of-mouth about as well as it garnering some great reviews. My reason for my skepticism was that the film’s poster billed itself as having been “a film shot entirely on an Iphone 5”. To me that felt like a gimmick. And being in that I’m an anti-technologist, that in and of itself turned me off to it. Then a friend of mine messaged me recently and asked – “hey, have you seen “Tangerine” yet”…I thought it was one of the funnier independent comedies I’ve seen all year”. It was simply based on this person’s recommendation of it that I decided to give it a whirl. Given that it was playing right at the same time as the film prior had let out. “Tangerine” revolves around the story of a trans gender woman living in Los Angeles named Sin-Dee. A prostitute who at the beginning of the film is released from jail after a short month-long stint for a drug charge. She meets up with the other main character of the film, her best friend Alexandra, another trans gender woman, who spends most of her time like Sin-Dee does, turning tricks for cash. The basic story line is rather simple – Sin-Dee gets word that her pimp/boyfriend, Chester, has his time during her stint in jail in the company of another prostitute, Dinah, who she vows to find and pay her back for her wrongdoings with Chester. From that point forward we see, well, the daily lives of two inner-city trans prostitutes, as they weave their way in, out, and all around L.A. in their quest to find both Sin-Dee’s cheating boyfriend Chester, and the unfortunate woman who he’s been cheating on her with while she did time for him in jail. This was a film that had some rather strong components of it but overall wound up being a flawed one as a whole. The first thing that came to mind as I was watching it was that it felt strikingly similar to Larry Clark/Harmony Korine’s “Kids” (1995). Except with an updated, almost contemporary feel that depicted the day to day lives of trans gender people living in L.A. as opposed to teenagers living in New York City. It starts off rather engaging with a hyperkentic style and use of editing that initially reels the viewer in to its story. Also, something should be said for what I called its “gimmick approach”. As a viewer the fact that it was shot “entirely on an Iphone” didn’t once cross my mind. As director Sean Baker does a rather deft job at making it look real and not grainy as one would expect, which I found quite inspiring from a technical standpoint as in this age of film and digital movie making, you can actually film a movie (and do it well mind you) with just your phone. As reluctant and apprehensive as I am to wanting to admit it. It also boasted a great, all-instrumental score of hip-hop, electronic, and otherwise “urban” music, which I thought lended itself quite well to the material and the images we were being shown on screen. Those things aside, It mostly fell flat in terms of its execution and where the story goes with its too main leads. It tries to introduce one too many subplots in its short 90 minutes that don’t seem all that believable or maybe better put, aren’t that engaging. The many subplots makes the ongoing shifts in the film’s tone jarring and simply not all that interesting. Added into the fact that there’s a third main character who is introduced about halfway in, a cab driver on the prowl solely for trans prostitutes (which does actually produce one hilariously funny scene where he unexpectedly pays for a “non” trans person’s services only to find out via “The Crying Game” that she (or “he” as he expects her to be, isn’t really who he thinks she is). But outside of the strong look of the film and glimpse into an otherwise unfamiliar contingency of people, the current trans world, I found it to be somewhat politically incorrect (without trying to bring politics into my analysis of a film), somewhat misogynistic, and also inflammatory against the gay community. As these characters don’t really have much or dimension to them other than that they are “trans gender prostitutes”. Added into the fact that the film’s “climax” (if you want to call it that) feels underwhelming and a bit too predictable as all sides emerge to intersect with one another coincidentally. This is a film more built around a good idea than it was in its execution. Not something I would necessarily recommend, but in some ways something that I could admire in terms of conceit over storytelling. Winner of both the Grand Jury Prize and Audience Award at this year’s Sundance Film Festival, “Me And Earl And The Dying Girl” came with much anticipation (as you may have read in my Top 10 Films of the Summer Movie Season section). I essentially knew little to next to nothing about it. And only very recently saw a trailer for it when I was seeing another film last weekend. What I did know is that for a movie to be bestowed the 2 above awards at such a prestigious festival such as Sundance (the last film to have pulled off both awards was the year prior with Damian Chazelle’s “Whiplash”). So really knowing next to nothing about it, other than what I could discern by the movie’s title and a trailer that surprisingly revealed very little. This looked like it could be one of those perfect indie sleeper hits if from the little bit that I had heard turned out to be true. METDG involves 3 central characters, all of whom I had previously been unfamiliar with prior to seeing this film. There’s Greg, the self-absorbed, quick witted loser who lives with his two eccentric parents (Nick Offerman playing his dad is a total stand out), Rachel, an acquaintance of Greg’s who we learn very early on is diagnosed with leukemia, and Greg’s “business associate” Earl, which is really what they just call him because together they make their own self produced films, which are more or less updates of older films of movies they love. Greg is coerced by his mother to go visit Rachel which he is reluctant to do at first because he knows it will be out of pity. But then the two of them sort of “hit it off” so to speak, and Greg becomes an integral part in Rachel’s treatment of her leukemia along with his (again “business associate”) Earl. As the two of them bind together to make Rachel a film in case she winds up succumbing to her disease.